Now, I realize that the mole the holiday is dedicated to is a unit of measurement in chemistry. However, the moles we care most about at the Temple of Gaia are little mammals who dig tunnels in the lawn. There were moles in the Temple lawn when we moved here 15 years ago. The late High Feline Priestess Patches, who had been a stray cat early in her life, had developed a fondness for the little creatures. Finding them tasty, Patches (a mighty hunter) made it her business to rid the grounds of them. Over the course of time, she did an excellent job of it. It has been quite some time since I found mole tunnels in the lawn. Today I performed a ritual at the creek. Afterwards, I decided to walk all over the Temple grounds and, among other things, look for mole tunnels. 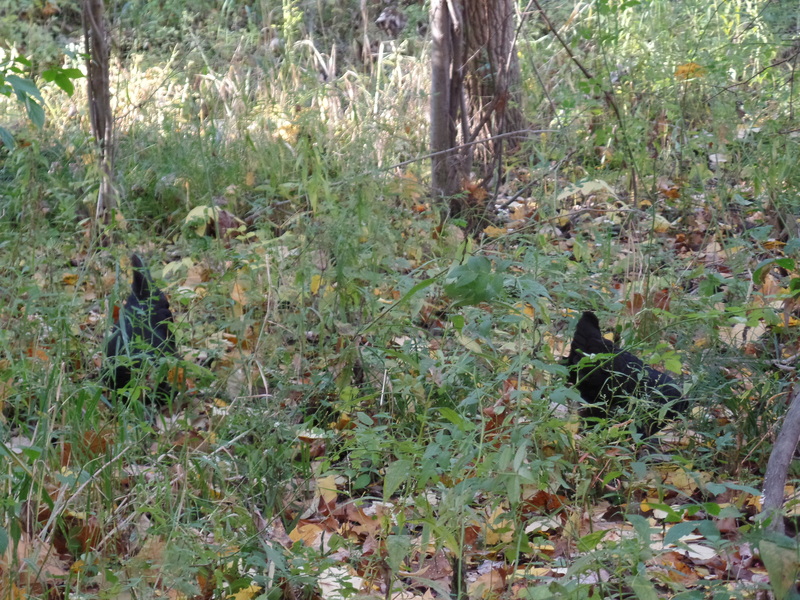 Those I did not find, but imagine my surprise when I happened upon half a dozen chickens behind the willow tree. 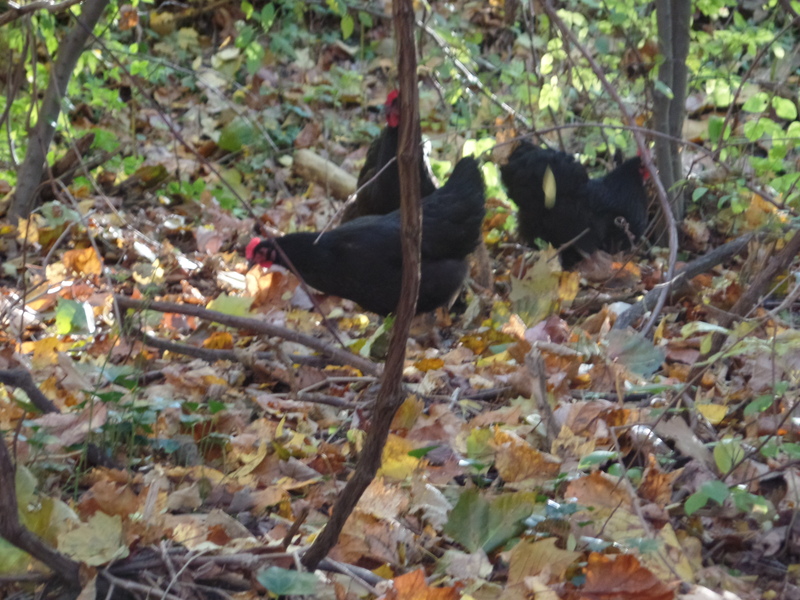 I fetched my camera and proceeded to memorialize the Cluck family. 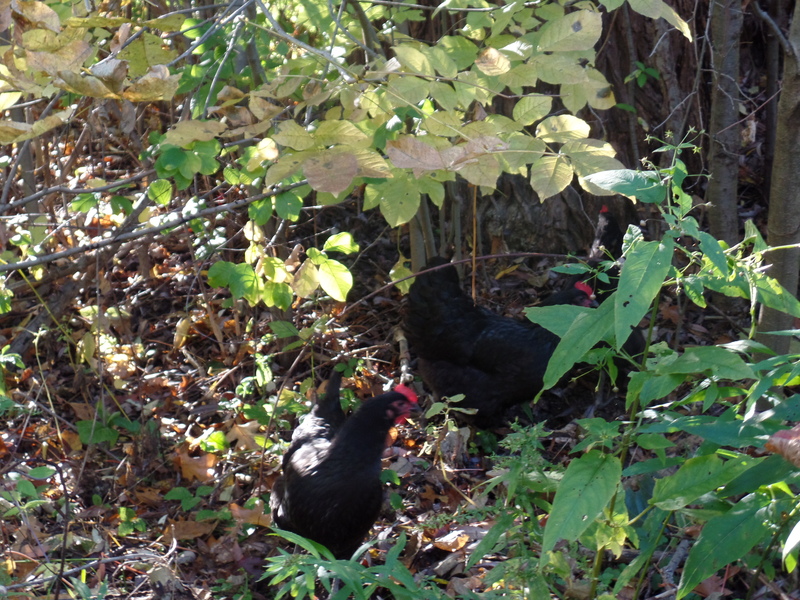 The chickens may be a bit hard to see as they are camouflaged well in the shadows cast by the willow. Please look closely. There are two chickens in the above picture. Now, I have not always been a huge fan of chickens. I was traumatized at the age of 4 when I was tasked with feeding my grandfather’s chickens. They pecked me! Talk about biting the tiny, little hands that feed you! I cannot say that we have been on friendly terms since. In turn, chickens tend not to view me with anything but unease, if not outright alarm. Therefore, when I made the effort to speak to them in (what I hoped was) a gentle tone, they got a vaguely disturbed look in their eyes and headed into the woods. There, they continued their pecking and clucking loudly enough so that it was easy to hunt for them. I know that there are 7 chicken portraits here. However, there were only 6 chickens. One of them has become enamored of the camera. Hope you enjoy pictures of chickens!